His father -- the first Theodore Roosevelt, 'Greatheart,' -- is a figure of unbounded energy, enormously attractive and selfless, a god in the eyes of his small, frail namesake. His mother -- Mittie Bulloch Roosevelt -- is a Southerner and celebrated beauty. 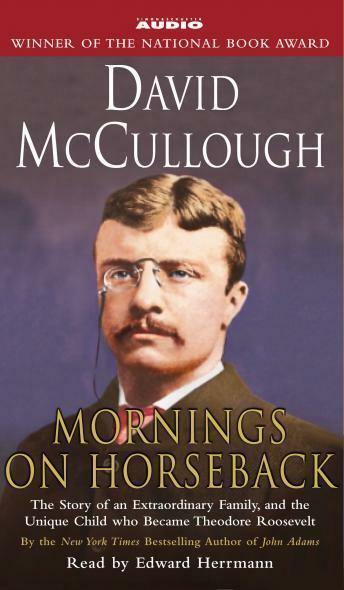 Mornings on Horseback spans seventeen years -- from 1869 when little 'Teedie' is ten, to 1886 when he returns from the West a 'real life cowboy' to pick up the pieces of a shattered life and begin anew, a grown man, whole in body and spirit. This is a tale about family love and family loyalty...about courtship, childbirth and death, fathers and sons...about gutter politics and the tumultuous Republican Convention of 1884...about grizzly bears, grief and courage, and 'blessed' mornings on horseback at Oyster Bay or beneath the limitless skies of the Badlands.